Diabetes | Yikes! No Carbs Please! Chocolate and diabetes ?- Does chocolate have a place in a diabetic’s food plan? Do you think you need to stop eating chocolate because you have diabetes? Or start eating diabetic chocolate because you still want to enjoy it? Well, when I first started to seriously control my diet, I thought I had to stop enjoying chocolate (real chocolate, not the diabetic variety) otherwise my blood sugar would hit the roof – I used to eat tons of chocolate before I knew that I had diabetes. I would sometimes eat chocolate till I got sick! Now, I know – not all chocolate is chocolate! People think milk chocolate is good because there is milk in it … but … it also contains a lot of sugar. White chocolate – forget it. It’s not chocolate. There is no cocoa in it! It’s the dark chocolate you have to go for. And if you believe the various studies which purport unproven health benefits due to the substantial antioxidant content in chocolate (hinders the formation of free radicals), then this is another reason to not restrain your urge to indulge in a piece of good quality chocolate. The emphasis here is on ‘good quality‘. While scouring the supermarket shelves for low carbohydrate products to have as snacks, I noticed the difference in carbohydrate content between chocolate with varying amounts of cocoa. A lower carbohydrate figure points to a lower sugar content, a figure which may not always be shown on the label. My local supermarket carries a range of dark chocolate from a particular manufacturer with cocoa solids content ranging from 30% to 81%. So one day, I stood there and looked at all the fine print on the back of the packets and lo and behold, the chocolate bar with 81% cocoa solids had 22.8 gr carbohydrates in 100 gr chocolate. The whole bar weighs 125 gr and is already pre-portioned into 24 squares – that works out to 0.95 gr carbohydrates per square! Lindt (Swiss) even sells dark chocolate with over 90% cocoa. I bought a pack once but I must admit, it was really tasteless. Between 80% – 85% cocoa is about right for me. The important thing is to still look at the nutritional information at the back. Each manufacturer produces its chocolate differently. We can only hope that the nutritional calculations are more or less accurate. You have to try the different brands available in your area before settling for something. While on a trip recently in Asia, I picked up a bar of Whittaker’s chocolate (manufactured in New Zealand) with 70% cocoa. It was pretty tasteless and I felt like I was eating something synthetic. It could have been the emulsifier in the chocolate which contributed to this texture. I have come across this same sensation when eating other brands of chocolate (even 85% cocoa ones! ), so it is really important to try them out. 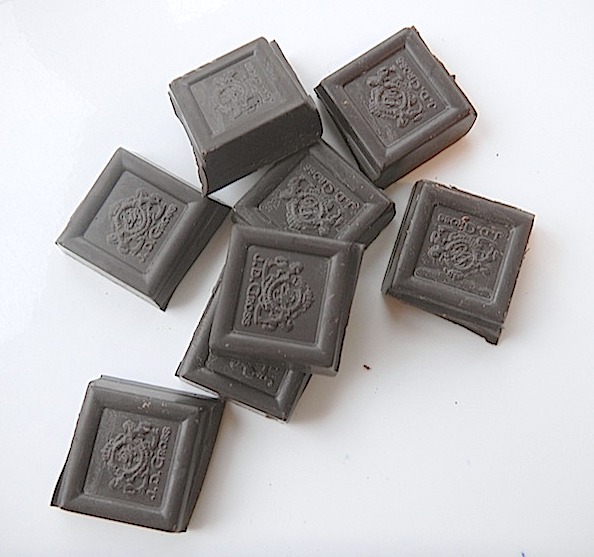 So don’t hold back – enjoy a piece of high cocoa content chocolate now and then without guilt! Make hot chocolate by putting two squares in a cup of hot milk. Drizzle melted chocolate over low carb berries. If you’re going to eat so little at a time, spend your money on good quality chocolate. Consume in moderation and you’ll still have your sugars under control! And please, stay away from that diabetic crap! Legumes, pulses, beans or lentils – aren’t they all carbs? Beans, beans, beans – I’m suddenly full of beans! No, I hope I’m not going crazy. Why then, the sudden interest? It all started last week when I found a cake recipe containing white beans. Curious, I started surfing for more recipes and found that there are cake recipes using all kinds of beans. Cooking with beans is nothing new to me. Prior to this, I had been using beans in my cooking – chili con carne, chili sin carne, cassoulet, feijoada, gallo pinto, red bean soup, to name a few – but soemtimes, I found that my blood sugar readings were high after the meal. I rationalized that this was because beans are high in carbohydrates and if a dish is made up primarily of one ingredient, it goes without saying that you would be eating a lot of that particular ingredient in one serving. So except for soya bean-based products (soya beans are funnily, low in carbohydrates but high in fat), I have been avoiding bean dishes. You’ll later see that I was too quick in throwing beans out of my diet. Baking with beans is however, something new to me. After seeing the nutritional information for one muffin made with white beans on the Healthy Indulgences Blogspot, I was intrigued and decided to try one of the recipes. I now realise that if you bake a cake, you only eat a slice or a muffin and since your intake is much less, there are less carbohydrates to convert to glucose and hence, the better post-priandal glucose values. I’ve tested this out and am very happy with the results! Yay, I can eat beans again. So let’s take a closer look at the BEAN. Beans fall into the class of vegetables called Legumes or Pulses. Legumes have been part of the human diet for a long time. Evidence that these have been eaten as early as 5000 years ago have been found in settlements in many parts of the world. Today, legumes still form a part of our diet, enjoyed by both vegetarians and non-vegetarians. There are over 1000 types of legumes out there. Dried legumes are broken down into three categories – beans, peas and lentils. Beans are favoured in western cooking – white canellini beans, red kidney beans, garbanzo beans (chickpeas), black beans and pinto beans. The Chinese use soya beans a lot and turn them into all sorts of delicacies and products ranging from silken bean curd, soya bean curd dessert, soya bean milk, fermented bean paste, tofu and so on. Indians cook up some great dishes with lentils, called dhal in Indian. Have you heard of moong dhal, chana dhal, urad dhal or tuvar dhal used to make vadas, sambhars and likes. Let’s go back to the carbohydrates mentioned above – the complex carbohydrates. The main goal of any diabetic is to try not to increase blood sugar too much.That is why we try to avoid eating foods containing sugars and carbohydrates and are following a low carb diet. I’ve recently learnt that there are good and bad carbohydrates. The good carbohydrates are digested more slowly, causing blood sugar to increase slowly over a longer period of time. These foods have a lower glycemic index. Good carbohydrates are complex carbohydrates, also called starchy foods. This carbohydrate is called complex because it is made up of chains of three or more single sugar molecules linked together. The bad carbohydrates are the simple carbohydrates containing singular sugar molecules and these are found in sugar, white bread, sodas and sweets. I can testify to that – when I eat white bread, rice or stuff loaded with sugar, these foods cause spikes in my blood sugar and are really difficult for me to control with insulin. So contrary to popular belief, not all carbohydrates are bad! Well, the complex carbohydrates still aren’t good in large amounts but if you are going to eat carbohydrates, then choose those of the complex carbohydrate variety, like beans and try not to eat too much at one go. And now back to the beans – besides all the positive points mentioned above, there are a host more. Let’s not forget the vitamins and minerals they contain, among them folacin (also known as folate or folic acid), thiamin, some B vitamins, iron, phosphorous, magnesium, manganese, potassium, copper, calcium, and zinc! Wow! This may sound too good to be true but wait a minute, you say – beans cause flatulence and I can’t have that. Yes, beans do cause flatulence. Beans contain a type of sugar molecule called oligosacchiride. Our bodies lack the enzyme to break down oligosaccharides. These unbrokendown oligosaccharides are digested by bacteria in the large intestine causing gases to develop. There’s a way around that though. Rinse your canned beans thoroughly before using. Do not use the liquid it comes in. Better still, start from scratch with dried beans, soak them overnight in water with about 1/2 tsp baking soda (sodium bicarbonate). In the morning, throw away the water and rinse thoroughly before cooking. Adding baking soda to the water helps to relieve ‘gastrointestinal problems’. 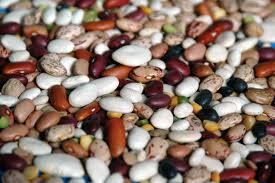 Here is a link to a chart which gives the nutritional values of several types of beans. Jack and the Beanstalk was one of my favourite fairy tales as a child. I also read it often to my daughter. In the story, Jack traded his mother’s cow for some magic beans and got a big scolding for his stupidity. In the end, those beans really turned out to be magic and brought wealth to him and his mother. I do love fairy tales as there is always a happy ending. Well, it looks like beans can also contribute to a happy nutritional plan for diabetics and low-carbers and bring us a wealth of health so don’t cut them out completely! When you’re new to low carbing, everyday is a new experience. Well, today I want to share my experience on my doctor’s visit. If you’ve read this blog from the beginning (which isn’t very long ago), you’ll know that I only started low carbing the second week of April 2010. I carefully documented my blood sugar measurements throughout the day, trying to link highs to what I had eaten and the amount of insulin taken and to workouts. It has been a painful process – painful for my fingers (7-10 pricks a day) and painful in that I had to remember to write everything down. When you go out, it is a little inconvenient to remember to measure blood sugar on time. After 4 weeks, I decided it was time to visit my physician and talk to him about it. I was excited and yet apprehensive of the visit – what would he say? To my decision to go on a low-carb diet – he was not against it. He said that the medical profession is beginning to recognise that a low carb diet is not a bad thing at all, if you are able to follow it. He was very impressed with the meticulous collection of data and said that he could learn a thing or two from me. I showed him my ketone readings which were ++2 (level 3 out of 4). He laughed and said ‘you’re burning fat’! I took that as a positive comment. To my decision to try and get my Hb1AC down to under 5 – he didn’t agree to that. He said that in Germany, the German Diabetic Association follows guidelines similar to the American Diabetes Association (oh-oh!) and recommends that diabetics keep their Hb1ACs below 7 to minimize damage to the various organs and nervous system. A good Hb1AC for me would be between 6 and 6.5! 4.6 is an impossible target for a diabetic! I told him that there were many people on the English language forums with Hb1ACs of around 5 and this is what people are striving for. He didn’t buy that and said that this is the wrong way to go. Anyway, after promising that I wouldn’t low carb myself into a stick and disappear from the face of the earth in my efforts to reach 4.6, I left with his blessing that I could continue low carbing as long as I felt good. At home, I searched the German diabetes websites to see what the general concensus was and it is true – everywhere I read that my aim should be – get that Hb1AC under 7. Well, I know that my risks for heart failure and other diseases will reduce under 7 but I still want to try to get it to the low 5’s. Will I make it ? – well, keep tuning in to see how I’m doing! A new USB storage stick? Yes, you’re half right! It is my new blood sugar meter – Bayer Contour USB with plug and play diabetes management software! I had a check-up and I mentioned to my doctor that I would like to buy a new meter as mine was already 7 years old. I said I wanted something with a computer software programme and he recommended the Bayer Contour USB as simple and easy to use. Even gave me one! After having tested this little piece of equipment which looks like a bigger version of a USB storage stick, I was amazed at what it can do and am thrilled to possess it. * no changing of batteries. There is a re-chargeable battery inside and you charge it just like your MP player. Connect it to your computer and in about two hours, it is charged. * there is no on/off button. Once you insert a test strip into the meter, it goes on automatically. No need to shut it off either. Pull out the strip and it goes off. * tiny amount of blood required. The test strips require about 1/5th or even less of blood compared to my last meter. The strips are also half the size of my previous strips from another company. Could be perhaps too small for those with big hands but are perfect for my small hands. * Autolog feature lets you mark your blood sugar measurement with notations such as ‘before meal’, ‘after meal’ or ‘no mark’. There is also the possibility to make notes using pre-defined remarks such as ‘activity’ or ‘sick’. * there is a reminder feature which can be activated and an alarm will go off after a set time which you can define. This is great in reminding you to measure post-priandal blood sugar. * ability to set your own target range. If your value is higher or lower than your targets, they appear in orange to get your attention. * summary – you can get a 7-day, 14-day or 30-day summary and it tells you how many times you were over or under your target! * easy transfer of data to your computer to analyse and study your results further using Bayer’s Glucofacts Deluxe Diabetes Management Software. * for those who want to measure their blood in the dark (can’t imagine why anyone would do this), you can put on a little light which will show you where you should insert your strip. Whoopee! No more writing down everything on a piece of paper! No more remembering to set the alarm clock! No more squeezing my fingers like crazy to get out enough blood. 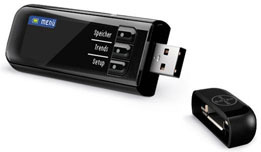 The Bayer Contour USB has been on the market since October 2009. The price on the package was €44.95 but I’ve seen it on the Internet being sold for €39.98 plus postage. This is a really good piece of equipment and if you are looking for a new meter, read all about it on Bayer’s website. Update 3 Jan 2011 : I was quite upbeat when I got my new Bayer Contour meter but I now find that it is not all that accurate. Sometimes I get high readings and when I measure again immediately after, there is a difference of between 20-50 points in the readings. I mentioned this to my doctor (I mentioned a 20 point difference) and he said this was normal. I don’t feel this is acceptable. My last meter, an Accucheck Comfort, also sometimes showed differences between two consecutive readings but I don’t remember them differing by more than 20 points.